I first saw Toms on the feet of some random guy on the bus, and thought they were interesting looking. They kind of looked like Slip-On Vans, but more casual and comfortable, and not as good looking. I saw them on a lot more people and they really began to grow on me. The company was started in 2006, by Blake Mycoskie. He went to Argentina and was shocked to see so many children without shoes. So he created Toms. Literally, for every 1 pair you buy, 1 pair goes to a child in need. So far, over 140,000 pairs have been given to children in need. Talk about guilt free shopping!! My mind more made up, I decided to ask someone who had already bought a pair to see if it was really worth it (I really do my research when I buy something). I remembered that the lovely Jane from Little Violet Dress had bought a pair and read that she loved them. I asked her what she thought and she said that they were really comfortable and definitely worth it because of the good cause behind it. Now to find the perfect pair: after a bit of research, I stumbled across these from Shudoo. I am so glad I chose this colour. They are really fun looking and as Leia wrote, perfect for spicing up an outfit! I absolutely love them! I've been wearing them today and they are so light and comfortable. I love the colours on the pair and I know I'll definitely be wearing them a lot! So do your bit and buy a pair of shoes! P.S. The winner of the Perricone giveaway are the lovely girls from We Were Damsels! Congratualtions. Email us with an address and we'll pass your details onto Perricone. Congrats on your Toms. You helped a child by purchasing one. I ordered my Toms already. Can't wait to get my feet in it. But being the boring me, I ordered black. Hahaha! They look great on you! I will have to look into buying a pair! Your Toms are awesome! I've been really wanting a pair, especially all the new fall styles they have. It's such a great company. yaaaay! i love my TOMS so so so much, and now i have my mom hooked on them. they're super comfy and so fun! Wow, that's a really great cause! And you chose some awesome shoes. Such a great company! Congrats on your fab purchy, darling! Not only are you helping a child, but I'm sure looking at your nice and colourful shoes make both you and other people happy too! Hey I stumbled across your blog on The Sartorialist! I am really liking it alot. I think you might be interested in checking out my site that I just launched a few weeks ago. It is an online fashion hub that showcases student designers to emerging brands. I really like them! They look great with your outfit! The colors and design are just so cute. I found out about Tom's a few yesrs ago, before the big craze hit- but aren't they cute? At first I thought they were a little questionable, but i saw a really cute sequined pair and loved them from there on. Yours are cute too! 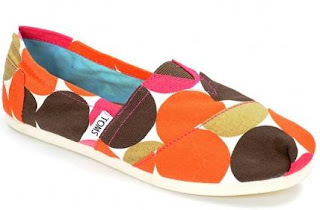 I have recently become OBSESSED with TOMS shoes! They are super comfortable and so cute especially the gold glitter shoes that wear to FSU games and get so many compliments. you look adorable in them! They're very popular here in California.